Point Grey Inter-Mennonite Fellowship (PGIMF) was begun by individuals interested in creating an inter-Mennonite congregation west of Main Street that could relate to Vancouver’s university students. The fellowship first met in September 1986. Known as the Point Grey Fellowship (PGF), they rented the chapel of The Menno Simons Centre, a former convent that had recently been purchased by The Pacific Centre for Discipleship to serve as a residence for Mennonite and Christian university students. The initial PGF attendees came from three Mennonite traditions: Mennonite Brethren, General Conference, and Mennonite Church. The small fellowship, which has always worked by consensus, was lay-led (1986-1988), when Palmer Becker was invited to serve from 1988 to 1991 as the fellowship’s part-time pastor and as part-time University Chaplain (supported by the Conference of Mennonites in British Columbia). Following the unexpected departure of the fellowship’s second pastor, Murray Phillips, in 1991, PGF once again became lay-led (1991-present). Point Grey Fellowship was accepted for full membership in the British Columbia Conference of the Mennonite Brethren (MB) Churches in 1987. After it was granted associate membership in the Conference of Mennonites in British Columbia (now Mennonite Church British Columbia) in 1992, PGF changed its name to Point Grey Inter-Mennonite Fellowship in 1993. Later changes to conference polity permitted the fellowship’s full membership in both conferences, making it one of very few dual-affiliated MB / MC congregations in North America. Relying solely on volunteers to coordinate and create worship services, lead music and administer, the fellowship’s speakers come either from within or from other congregations, church agencies and seminaries. A pastoral care committee coordinates care giving. The fellowship’s creative worship services typically include four-part hymn singing, extensive scripture readings from the lectionary, children's features, the sharing of concerns and congregational prayers, and talks followed by 15 minutes of open responses. Since many attendees commute, PGIMF relies on weekly coffee hours, a book-study group, monthly potlucks, and informally-formed lunch groups to help to create a sense of community. 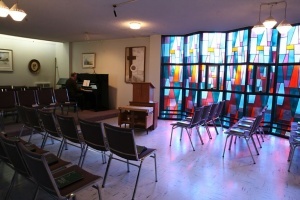 The fellowship celebrates its Anabaptist spiritual heritage, its love of music and singing, its keen interest in the visual arts (the chapel is also an art gallery), its opportunities for students and laity to give sermons and participate however they wish, and its extended discussions during which ideas from the morning’s meditation are related to things being read or to life as it is being experienced. The fellowship intentionally does not own property, and nearly 70% of its annual budget goes to support outside activities, the various conferences, missions, Mennonite Central Committee, and similar charities. Canadian Mennonite (2 November 1965): 13; (9 August 1966): 9; (14 March 1967): 3; (14 November 1967): 3. Mennonite Brethren Herald (27 May 1988): 20; (1 May 1992): 18. Mennonites in Canada files, "1960-British Columbia," Mennonite Archives of Ontario. Pekovich, Andre, Evan Kreider and Janice Krieder. "Point Grey Inter-Mennonite Fellowship (Vancouver, British Columbia, Canada)." Global Anabaptist Mennonite Encyclopedia Online. February 2016. Web. 18 Apr 2019. http://gameo.org/index.php?title=Point_Grey_Inter-Mennonite_Fellowship_(Vancouver,_British_Columbia,_Canada)&oldid=142819. Pekovich, Andre, Evan Kreider and Janice Krieder. (February 2016). Point Grey Inter-Mennonite Fellowship (Vancouver, British Columbia, Canada). Global Anabaptist Mennonite Encyclopedia Online. Retrieved 18 April 2019, from http://gameo.org/index.php?title=Point_Grey_Inter-Mennonite_Fellowship_(Vancouver,_British_Columbia,_Canada)&oldid=142819.